Are you looking to get involved in the crypto-casino revolution by playing at a trusted Bitcoin blackjack casino? Or maybe you want to find out to best place to deposit, stake and withdraw Bitcoin when playing online blackjack? Either way, we’ve got everything covered. Blackjack has come a long way from the days of shady land-based casinos, with no safeguards in place to ensure that the dealer is in-fact legitimate. On the contrary, it is now possible to play within the comfort of your own home, fully facilitated by a credible provably fair operator. This guide will provide an overview of the rules of blackjack, as well as how to maximize your chances of walking away a winner. After that, we will also cover the different variants available, followed by a list of the best online crypto-casinos to play it. By the end of reading our guide from start to finish you will have all of the information required to make an informed decision. Let’s start by finding out what the actual rules are. Although there is no definitive answer on when blackjack first become mainstream, the general consensus is that it was first created within a French casino in the 1700’s. Interestingly, it was originally labeled as “Vingt-et-Un”, which translates to 21. The concept of Bitcoin blackjack is simple. A dealer shuffles a deck of cards to both the player(s) and them self. From the players’ perspective, the aim is to score a higher number than the dealer, up to a maximum of 21. To clarify further, let’s imagine that there is just one player at the table, hoping to beat the dealer. The card distribution is as follows. The dealer gives the player one card face up. The dealer gives them self one card face up. The dealer gives the player another card face up. The dealer gives them self another card, but face down. At this point of the game, the player will have two cards face up. Before proceeding further, here is an overview of the value of each card in the deck. Sticking with the above, let’s imagine that the player is dealt a Queen and a Jack. This is a very good hand, as the player has a total score of 20. The maximum amount that either the player or dealer can hit is 21, as anything above this number would constitute a bust, which would result in an immediate loss in that particular game. Moving on, the dealer has one card face up, which is a 10. Now that all of the cards have been distributed, it is now the player’s turn to make a decision. Although other may exist, at this point we will make things simple. The player can either stick (which means that they want no more cards) or the player can twist (sometimes referred to as hit – which means the player wants another card). As the player has 20 out of a possible 21, it is logical for them to stick. Now that the player has made a decision, the dealer is ready to move. Obviously they must at least turn over their face down card, which in our example, is a 6. Here’s where things get interesting. The rules of Bitcoin blackjack (all variations) state that if the dealer has 16 or less, they must always hit. On the contrary, the player can stick or hit on any number. As a result, the dealer distributes another card to themselves, which is a Jack. That gives the dealer a total score of 26 (10+6+10), meaning that because they have scored over 21, they bust. The player wins! So now that you know the basics of Bitcoin blackjack, the next part of our guide is going to explore the rules a bit further. Everything that has been described so far is relevant to both real-world blackjack in a land based casino, as well as Bitcoin blackjack at a crypto-casino. As a result, let’s discuss the monetary side of the game. At its most basic level, players can choose how much they want to stake on a particular hand. Casinos normally have different tables for table stake sizes, for example low stakes, medium stakes and then high-roller stakes. For the benefit of simplicity, let’s say that you want to stake the BTC equivalent of $10. If you are playing at a table with other players (live casino – to be explained in more detail later), then as soon as everybody has decided on how much they want to stake, the dealer will begin distributing the cards. If you are fortunate enough to beat the dealer, then you will be awarded odds of even money (2.0), which means that you would have $20 returned. As this includes your original stake, you would have doubled your money with a $10 profit. On the contrary, if the dealer won that particular game (say for example you bust or they got a higher number than you) then you would have lost your $10. However, there is a third pre-defined odd also on offer that we haven’t discussed. If you are fortunate enough to make 21 when the dealer distributes your two original cards, you have achieved something called “blackjack”. For this to happen you will need at least a card that represents a 10 (10 or a picture card), fully supported by an ace card. At this point, as long as the does not also get blackjack, then you would be paid odds of 6/4 (2.5). In this respect, your $10 stake would return $25. The only alternative to you receiving these odds is if by chance the dealer also made 21. If this was the case, then the hand would be classed as a tie, meaning your original stake would be returned. This is the case whenever the player and the dealer finish on the same number. Depending on what cards you are dealt, there are also other options available to the player other than just stick or twist, which we will discuss now. First and foremost, if the player so wishes, they can do something called double-down. This is where the player can double their stake if they like the original two cards that were dealt to them. For example, if the player is dealt a 4 and a 5, totaling 9, then they may decide to double-down because if the next card is a 10 or a picture card, then they would hit a 19, which is a very good hand. However, there is also a “chink in the armor” to consider if you do decide to double-down, insofar that you are only allowed 1 more card in that particular game. Continuing on from the above example where you are dealt a total of 9, if the next card was a 4 (giving you a total of 13), then you would not be able to request any more cards. To further complicate things for you, some versions of Bitcoin blackjack also allows you to split your original hand of two cards. You are normally allowed to do this when you receive two cards of the same value. For example, if you were dealt two 9 cards, then you could split your cards and receive an additional two cards, essentially giving you two separate hands. Take a look at the below example. Player is dealt 2 x 9 cards. Before the above additional cards were dealt, the player would need to double their stake as they are effectively playing two individual hands. The player continues as normal and can now stick or twist as they so please. The final alternative option that we wanted to discuss was something called surrender. Again, this isn’t offered in every version of Bitcoin blackjack, but we’ll discuss it anyway. The surrender option is a way for the player to cut their losses prior to the dealer revealing their face down card. This would normally be beneficial if the dealer is showing an Ace as their face up card. Why? Because statistically speaking, there is a very good chance that the dealer will turn over a 10 or picture card, giving them the best hand possible – blackjack. If the player has the option to surrender, they would receive half of their original stake back and subsequently exit that particular hand. Although this isn’t ideal, it is a way for players to at least claw something back in the event that they feel they will probably lose the hand. So now that you know the different options available to the player, the next part of our Bitcoin blackjack guide is going to look at the different versions available. Just like in the case of roulette, there are alternative versions of Bitcoin blackjack. This is normally dependent on the country you are playing in, however as crypto-casinos are global, you normally have the choice of selecting the one you prefer the most. Here are the three most popular, however many more exist. Always check the rules prior to playing! This follows the basic rules however it allows the player to utilize the surrender option discussed earlier. Which Bitcoin casino offers which kinds of blackjack? So now that you have a compressive understanding of what Bitcoin blackjack is, how to play it and the different rules available, we have listed the six best crypto-casinos to play it. BitStarz: Created in 2014, BitStarz are a hybrid-casino offering both fiat and cryptocurrency deposits. BitStarz have a wide-range of Bitcoin blackjack games available, including European and American (Vegas Strip), as well as live dealers too. FortuneJack: Just like BitStarz, FortuneJack were created in 2014, hold a full gaming license and have a provably fair protocol on all of their games. 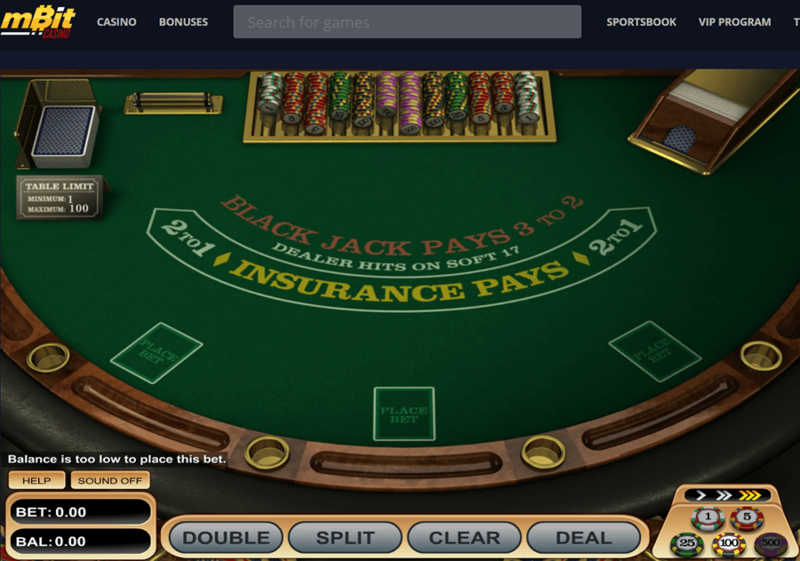 When it comes to Bitcoin blackjack, their choice of games are unrivalled. In total, FortuneJack have more than 55 different versions of Bitcoin blackjack, as well as live dealers too. Mbit Casino: Mbit are an established gambling platform offering both casino games and a full sportsbook. They offer a total of 14 different Bitcoin blackjack variations including European, American, Surrender and live dealers. Playamo: Created in 2016, Playamo casino are one of the more recent operators to join the crypto-casino revolution. However, they have quickly earned a strong following due to the nature of their fast payouts, clean platform and magnitude of games. When it comes to Bitcoin blackjack, Playamo offers more than 30 variations, including VIP tables, live dealers and of course the standard versions of European and Vegas Strip. Crypto-Games: This particular casino does things slightly differently, insofar that their target market is the absolute beginner. They offer just one version of Bitcoin blackjack – European. Their platform is clean and simple and they are fully regulated by the Curacao authorities. Their games are guaranteed for fairness by a provably fair protocol. Betcoin: Launched in 2013, Betcoin are one of the oldest crypto-casinos in the industry. Asides from their sportsbook, slots and live dealers, the casino also offers 27 variations of Bitcoin blackjack, including classic, European, multi-hand, single-deck and neon.